Ryanair is sending travel vouchers to the 315,000 passengers affected by its flight cancellations fiasco. The vouchers, worth €40 per cancelled flight (or €80 for return flights), can be redeemed on Ryanair flights between October and March 2018. There are several terms and conditions, however. The flights must be booked in October, the airline says, and cannot be used between December 20 and January 7 - the busy Christmas travel period. 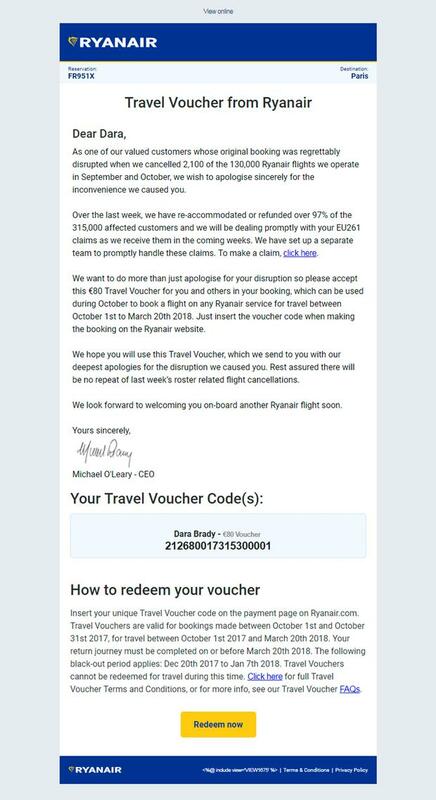 All 315,000 affected passengers will be emailed vouchers this week - with a code that can be inserted when booking on ryanair.com. The codes cannot be used for bookings on the Ryanair app. The vouchers are additional to any refunds, re-routing or EU261 compensation these passengers have already received, or are entitled to receive. 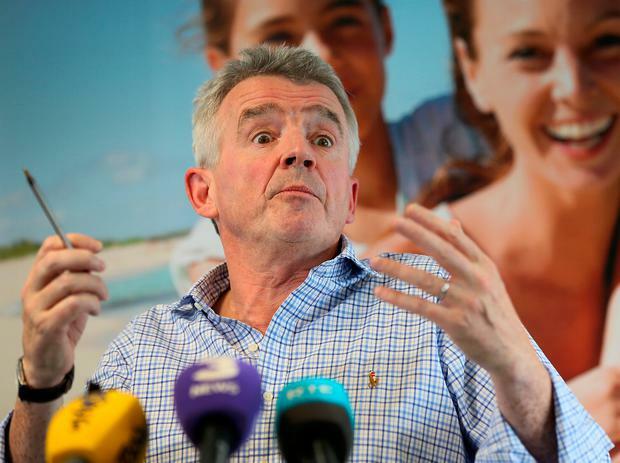 The emails are signed by CEO Michael O'Leary, who expresses his "deepest apologies" for the disruption this month. Between refunds, vouchers and compensation, the cancellations crisis is now expected to cost the airline up to €50 million, it says. 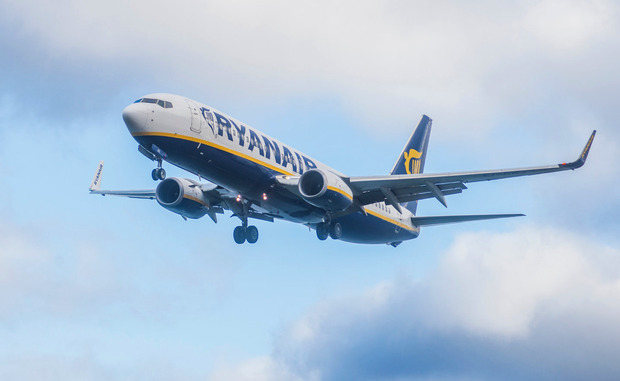 The news comes as part of a broader strategy Ryanair announced today for dealing with the flight cancellations fiasco. The plan will "eliminate all risk of further flight cancellations" it says, by flying 25 fewer aircraft this winter among other changes. The airline also plans to roll out a series of low fare seat sales for winter 2017, starting this weekend with one million seats on offer from €9.99 each-way. Ryanair cancelled 2,100 flights over a six-week period this autumn due to a "rostering failure", a move for which it has sincerely apologised. Over the last week, it has "re-accommodated or refunded" over 97pc of the 315,000 customers whose flights were cancelled, it says. Only customers whose flights were scheduled up to October 2 can claim compensation, however - as passengers receiving more than two weeks notice of a flight cancellation are not entitled to compensation under EC261. 99pc of its customers are unaffected by the flight changes and cancellations, Ryanair says. "From today, there will be no more rostering related flight cancellations this winter or in summer 2018," O'Leary adds.